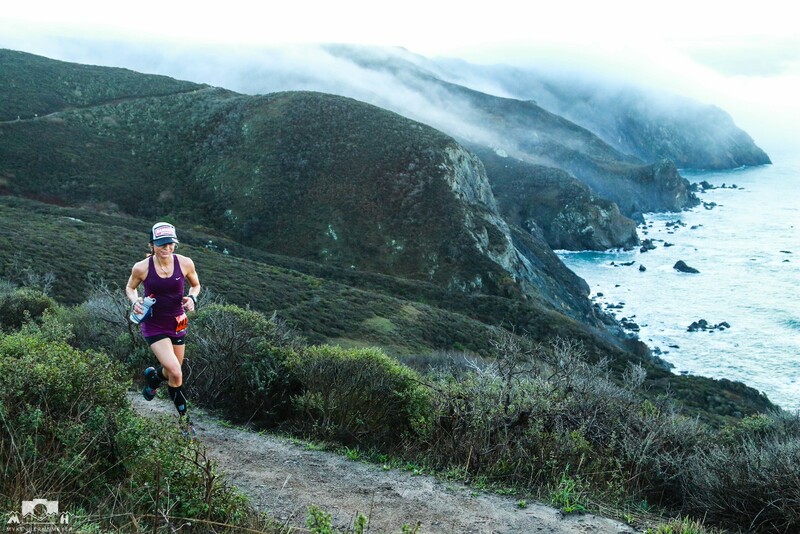 The North Face Endurance Challenge 50-mile Championships in the Marin Headlands of San Francisco is the final of six race events spanning the country each year. The 50-mile distance offers an unusually large prize purse of $10,000 to each of the male and female first place finishers, with $4000 and $1000 to second and third respectively, attracting the heaviest hitters in the ultra-distance trail running scene. Enriched with the talents of marathon runners trying their leg speed against a long course with nearly 10,000-feet of cumulative ascent, the elite field is respectably deep. Intrigue builds through social media, podcasts, and race previews speculating how talents will shake out as the multifaceted competition promises some dark horse surprises come race day. In the early morning dark of December 6th, waves of NFEC racers are shuttled to the start area amidst the soggy coastal bluffs of the Golden Gate Recreation area. The first “elite” heat of of about 100 men and 25 women, chosen by qualifying times, huddles behind a barricade illuminated by blinding lights and flurries of camera flashes until the blaring speakers announce it is time to approach the start line. The tense atmosphere bubbles with the excitement, confidence, and apprehension of smiling faces familiar from iRunFar interviews and UltraRunning Magazine covers: Krar, DBo, Vargo, Dakota, Sage, Olsen, Kraft, etc….an endless sea of talent. Sideways glances, size-ups, nudging to the front: it is all happening in real-time, and Sally McCrea and Alicia Shay from team Nike Trail Elite move past me toward the front with the men. With some undecipherable exclamations over loud speakers, the wave is released shoulder-to-shoulder along the start-line, and a world of stadium lights, bright colors, beaming headlamps, and endless shouting into a microphone closes down on the senses for a few more pulsatile moments like a rock concert mosh pit. Only a couple of yards between racers and the freedom of an open trail, and the tension builds. To my right, stands former Missoula runner Meaghan Brown, current associate editor at Outside Magazine, sporting her snappy TNF race kit. A late addition to the race, Meaghan’s reputation for speedy finishes grazed my mind as we exchanged a quick hug. We last met at the Rut 50K in Big Sky, Montana, and only in the small world of ultra running would we end up crammed together here randomly side-by-side. Jimmy Grant appeared then behind Meaghan, beaming. Co-founder of Montana Trail Crew, a non-profit started to encourage trail running in Montana, Jimmy is a stand-out Missoula runner for innumerable marathon wins and podiums. My Hammer Nutrition teammate and MTC co-member was trying his first hand at the 50-mile distance, and I had no doubts he would crush it. Just ahead appeared the famous-for-smiling face of Mike Foote, one of Missoula’s most favorite and talented runners, amongst the ranks of his other phenomenal TNF teammates. Finally, the countdown ensued, the race began, and athletes rushed upon the next several hours of running like recess time in grade school. Refreshingly cool coastal air welcomed the pack as it spread slightly on a short stretch of pavement before heading up the first fire road ascent. Due to heavy rains in the days before the race, the 50-mile course was re-routed to exclude some damaged trails and instead included two loops of this mild initial climb and descent. Soon, Jimmy greeted me again from my right in passing and simultaneously Magdalena Boulet of Team Hoka One One passed us on the left. Boulet, an olympic marathoner, was an easy bet for the win at today’s race. Her leg speed led to a 2013 NFEC 2nd place finish to winner Michelle Yates, despite the race being Magda’s first trail ultra. Moments after, Stephanie Howe of TNF team glided by on my left, and within a few hundred more yards I heard Megan Kimmel, who runs for Asics, coming up the hill past me, chatting casually with another male competitor. Between Boulet, Howe, and Kimmel there was little mystery about the women’s podium. Intent on running my own race, I lost track of my place quickly. Soon we descended and started upon a second loop. I let myself focus on smooth, relaxed running and made an effort to enjoy the scenery barely perceptible in the shining light of the full moon and glowing lights of San Francisco. A stream of headlamps ahead and behind traced the road cut in the rolling hills, a uniquely memorable sight. After a short climb up and over a small ridge, dawn emerged and the sky gradually transformed from sleepy salmon hues to a foggy blue over the crashing waves of Tennessee Beach, where runners would meet their crew for the first time at mile 14. There, I tossed my handy, headlamp, and arm-warmers at my husband’s feet, grabbing a second bottle as he cheered for me loyally. Generally ahead of my goal pace, I was unsure of the strategy suggested to me by friends: go out confidently and hang on for the ride. But there was no plan, no pain, and no temptations of money in my mind, so I just ran. It was more than a year since my last 50-mile, I was trained for 50km in the mountains (not a runnable 50-miler), and my latest training included weeks of sub-freezing temps on snow in Montana. Compounded by a head cold and a 17-hour drive to California, I told myself, “just hang on until ski season starts in 8+ hours.” By my best estimate, I needed an 8:15 to place in the top-ten, so that was my only goal. The pace broke a bit with downed logs and storm runoff on the journey northwest. Nearing the farthest reaches of the course, an out and back to mile 28 aid, the pace slowed further during several miles of making way for faster, inbound runners. Vargo was the first to pass me, followed by a pack of men including Krar. Sage and Dakota, among others, were already past this section in a speedy race to men’s podium. Within minutes, Magda passed me followed soon by Kimmel. After my more closely surrounding competitors made note of their rank, my peaceful solo run turned into an endless battle for a top ten finish. Descending into Stinson Beach, the second crew point at mile 33, the stifling humidity and heat started my body into an insidious mutiny. My right knee grew cranky and downright uncooperative. Cramping legs landed abruptly at each step, making navigation down the muddy stairs tricky. Filing into aid, I filled up on Endurolytes, Endurance Amino, and Excedrine and took in several cups of fluid. Not long after this stop, I careened off the trail to be sick in the brush. A few minutes and a couple places lost, I tried to keep the legs moving enough to catch up to the closest two women: Michelle Clarke and Helene Michaux. For nearly ten miles, we jockeyed closely for the lead. On the climbs I would pull away, then on the descents they would catch up or pass. Helene apologized politely several times trying unsuccessfully to gain the lead on the uphill. Upon the arrival at Cardiac aid on top of a ridge, we encountered what appeared to be a disaster relief scene, with runners from the concomitant NFEC 50km race lingering at crowded tables covered mostly with empty cups and discarded trash. Forcing my way to a volunteer, I pirated what little water she had left away from a poor 50km mid-pack soldier who stood back graciously, and I escaped with my waning morals down the muddy trail 50km runners struggled to ascend. What had been a relatively decent trail under a trickling stream of runoff earlier, was now a thick, sloppy mess of ankle-deep mud. Some not-so-cheerful folks were covered and stooped, wide-eyed and stunned, by the dilemma of how to get out of our way. Helene caught up to me and we exchanged a few words of amusement about our own struggles to stay upright while descending sharp switchbacks. Nearly 13 miles to go and energy waning, I had to let Helene go on the next climb. After mile 40, a long, steeper climb in full sun and mid-day heat slowed everyone to a labored walk. Counting steps to match some walking with some jogging, the ever-increasing cramps in my legs chided my efforts. One strong step and my calve would cramp, forcing my leg to buckle. Other muscles would cramp trying to save my body from falling. The disorganization of this rebellion was almost humorous. Long periods of time were spent ignoring hovering thoughts of failure, threatening me with visions of my first DNF. I couldn’t remember feeling worse in a race, which is how I felt at my last race in Flagstaff, and I started to seriously doubt the idea of ever having a “good” race. I forgot about top-ten. New goal: just finish. Mile 45 was the last aid where runners would see their crew. Bypassing the aid for the blue-room to be sick, I considered how ridiculous the scene must be for observers. My war against my own body, completely self-inflicted. But only six more buffed out, easily runnable, fire-road miles to go. My husband told me I was in twelfth, and I could see Michelle Clarke just ahead leaving aid. “You can do anything for an hour,” my mind reeled, “only a couple more miles of climb…this is where you’re strong…TOP-TEN!” My thoughts seemed so silly but so necessary. In the spinning, shady mix were attempts to calculate new goals. “Can I get in under 8:30?…Didn’t the new race course specs say 50.8?” Concurrently, I counted my steps: “20, now hike for 5…time to run…” I passed Michelle, and felt a glimmer of hope. Eleventh place. Then, like a memory, or a good idea, something popped into my brain: a familiar sight, the back of Babak Rastagouford, a friend from Missoula! I was relieved, thankful, he was there in his red shirt, like a small gift under the back of the Christmas tree. “Come on Babak, let’s run it in.” He started to jog, and I felt stronger immediately. My mind turned to group runs with my girls from home, Babak’s girlfriend Suzie, balloons they bought me before the US Skyrunner Series final race, the card: “from your Missoula fans!”, all the challenges the girls pushed through with me, a note of encouragement from my new co-workers, words from a friend: “go bag that top-tener!”, my favorite runners who weren’t running because of injury, how lucky I was to be running, and gradually, I gained momentum. A strange rush of relief and sorrow washed over me at the top of that final climb. My leg muscles grabbing randomly, tears in my eyes, self-doubt fighting with some anger at missing out on my goals; I wanted that top-ten spot, if nothing else. I could see below the last lady who had passed me, Susan Barrows, who was in tenth, so I ran. For the first time in hours, I legitimately ran, and it felt good. Tears streamed down my face from the wind and the pain, and maybe even from the shame of a race gone seriously wrong. As the descent leveled, I felt Susan there right behind me, trying to make the pass. I hit the final paved uphill and ran alongside choked traffic, feeling the stale air of a race that had finished over an hour and a half ago. Pulling one last time from months of hill-repeats, I pushed, driving knees forward, and finally saw again that damned inflatable arch. Over the finish line, Bryon Powell of iRunFar caught a quick photo of me, and it hit me that I got it: tenth. Within seconds, Susan piled in behind me and we exchanged some kind words of thanks for the push. Finally over, all the disappointment of a hard-fought, unsatisfying battle against myself sunk into my chest, and I threw up. The last thing the world needs is another “pushed through physical adversity on mental grit” story, but every person in an ultra has one, and they never really get old. Pushing through defeat to find personal growth is a feat in itself, and lessons learned, we come out stronger on the other side. In a few days, after some perseveration about everything that went wrong, we are all back on UltraSignup.com looking for the next opportunity to put things right and run to our potential. But the real challenge for me is delineating what when right. Every race has it’s own set of challenges for sure, and specificity of training is essential to each race. Even if your training does not measure up to the challenges of race day, recognize what went well, evaluate what could go better, and stay the course. It will only pay off in the long run. Run strong.